Many have written about our unique vCommunity, predominantly with positive comments as they describe their interactions, experiences or opportunities that have been made possible by participating in these groups and engaging with people that share same interests or lines of work. I want to do my part and share what the greater virtualization community means to me, what it has allowed me to accomplish and why I feel proud to be associated with it. I also will take this opportunity to acknowledge and thank many individuals who have helped me in my path, one way or another. 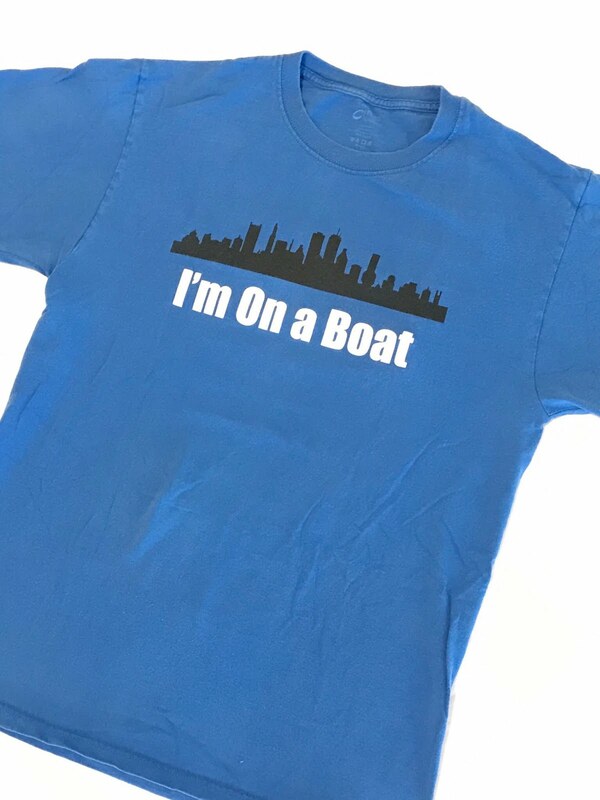 If you are reading this post and know me from social media, mainly in Twitter, you know what group of people I am referring to; whether you identify it as the vExpert, VMUG, vBrownbag, VTUG or simply the vCommunity, we are one of a kind; you may read/hear this same belief consistently from others and if you are new around or not involved too much, you may think we exaggerate a bit, but the reality is that, that many of us can’t be praising something just for kicks, there is definitely something great about being a member here and you are welcome to join. My story in the community begun back in 2012 when Randy Castle who led a team I was part of, persuaded me to attend a VMUG meeting in Boston; - Thank you for insisting Randy! That September of 2012, BostonVMUG held the event in a very unique place, they rented two cruise ships at the Boston harbor, The Boston Spirit and one other I can’t recall the name of; that was a cool and additional incentive to be there and learn what the whole thing was about. That time is one I remember well, not only because the cool location (check out some pictures from 6 years ago here), but also because I met Steve Athanas, Mariano Maluf who at the time was the VMUG President, and Rob Bergin for the first time; by the way, it was Rob who on that day told me that if I wanted to be “in-the-know” in the virtualization world, I needed to open a Twitter account and follow the right people; well, Thanks Rob! ; even though I was hesitant about Twitter at first, I learned over the years how useful the platform can be. 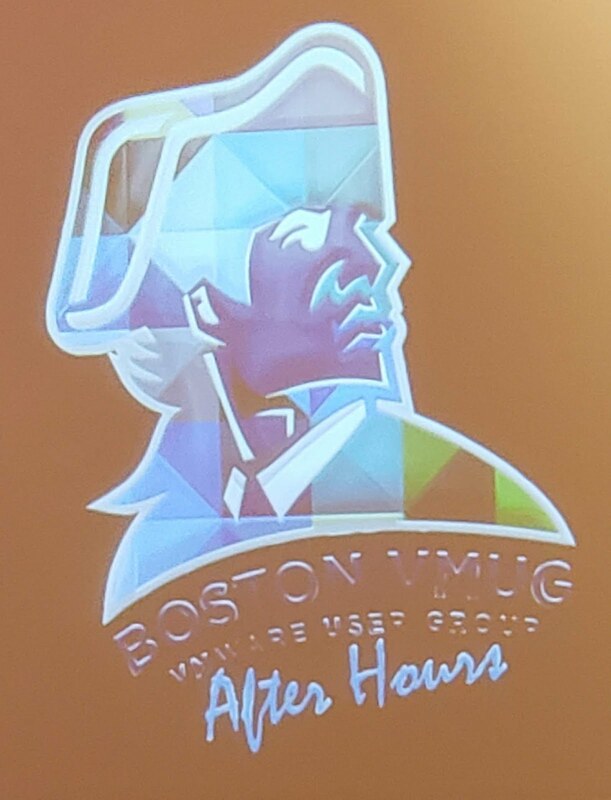 After that first VMUG attendance, many consecutive BostonVMUG events had my presence, I wanted to learn and grow my network, everyone made me feel welcomed and the opportunities to meet virtualization and technology experts one-on-one and go back to work with new applicable knowledge was always awesome. There were years when 2 UserCons were arranged in Boston and the place was packed, every time; it quickly became a can’t miss event for me. 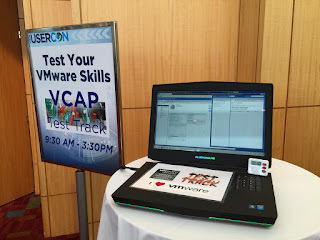 One of those UserCon days, the summer of 2014, the organizers had Joshua Andrews bring the mobile TestTrack and Josh had a contest going where the participant would pick a card at random from 10 lab exercises, the person who finished the lab correctly in the shortest amount of time would win the prize at the end of the day, the prize? a VCAP exam voucher – nice! It was my lucky day as I was able to properly complete the test lab within few minutes. What I must admit here is that the stars had lined up for me as right before the TestTrack challenge, I had participated on a session that covered in detail what the lab asked to do – this was meant to be, that’s what I always say - pure coincidence when I picked that same subject for the lab; things just worked out for me that day. By virtue of being there, engaged in the event, attending sessions and participating, created a chance of a free VCAP voucher. 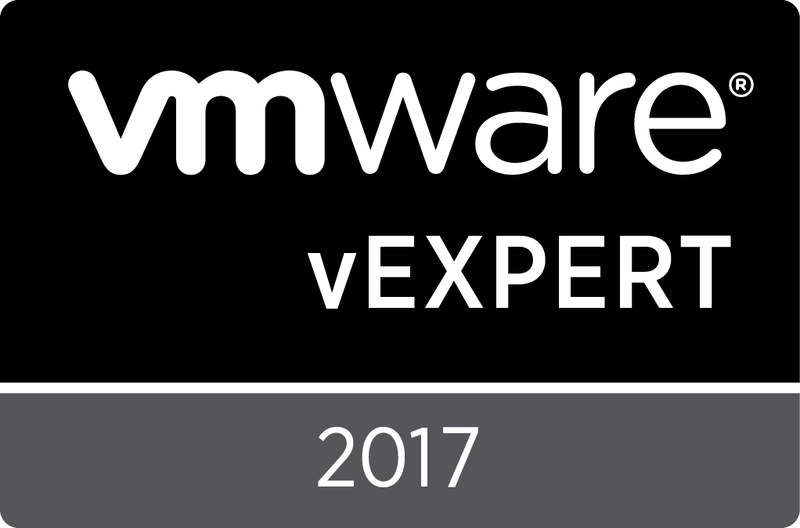 Although I had a valid VCP at the time, going for the higher-level certification wasn’t in my plans that year, but there I was, with a voucher good for a year and great resources to practice, also provided by Josh. After studying for a couple of months I took and passed the VCAP-DCA. Big thanks to Josh for his TestTrack, the voucher and opportunities to practice on his lab! Steve Athanas calls my anecdote as “a VMUG success story”, I agree with him and I’m grateful. 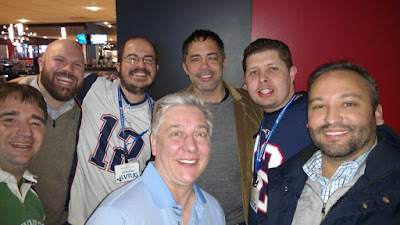 During these and future VMUG and VTUG events, I also met Jonathan Frappier, Luigi Danakos, Mark Gabryjelski, Brian Graf, Matt Bradford, James Mueller and many others. Through Jonathan I learned of vBrownbag and their webinars on Wednesday nights, which I attended on occasion – Thank you Jonathan! Partaking in all these virtual and in-person events, with great deals of knowledge being shared and connections made… what is not to like? Me, like many in the IT field tend to be introverts or describe as such; but for some good reason, when engaged with the people that make up our community, I feel comfortable and have been able to grow not only with technology but also on social basis, enhancing interpersonal, communication and other soft skills. Thanks to the vCommunity for this! When I attended my first VMworld in 2016, I had the chance to meet Ariel Sanchez in person, he was wearing his famous hat and that’s how I was able to spot him in the crowd at the vendor expo. As the world knows, he greets people like we’re his relatives and encourages everyone to be better; Ariel has helped me a lot and was my mentor to become a vExpert, to start this very blog and to take a shot at presenting on the vBrownbagLATAM channel. After meeting Ariel and many other friends from Latin America at that VMworld, we stayed in touch by way of a group chat, we’ve been very active there since and it was through this ‘staying in touch’ that on July 2017 an open position at VMware was shared with the group by guess who? El Señor Sanchez, who few months earlier had joined the mothership – I became interested in the opportunity, followed up with Ariel, he followed up with his boss who was the hiring manager, and fortunately things worked out and that is the position I now proudly have. So, Ariel Sanchez, my respect and gratitude brother, not just for the referral but for being there and always willing to help me and EVERYONE. Thank you, Ariel! There is another person I’d like to thank in reference to becoming a VMware employee by way of this community, that is Matt Bradford, he was very supportive during my job application process helping navigate and learn more about the role. Thank you, Matt! You rock! 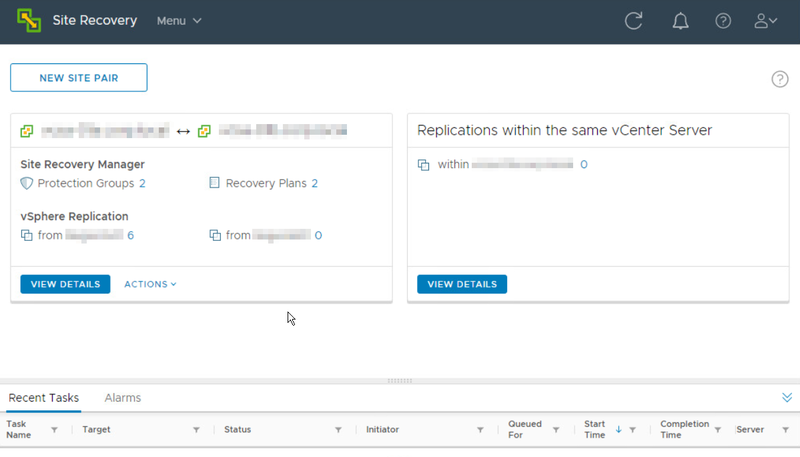 My narrative here is in no chronological order and I can’t leave out an experience that gave me great joy: having the chance to donate a VMworld pass; and after some time realizing that it could not have been obtained by a more grateful and kind individual, Al Rasheed. Last year, me and a colleague at my previous employer in Boston registered and planned for VMworld 2017, at the end, there was an additional registration code for the conference that no one was going to use, so I asked my manager at the time, Chris Mitchell, to please allow me to donate it, he kindly accepted. Thank you, Chris! This made a change in someone’s life. In late July, knowing that I had this code available, I reached out to William Lam and asked him to help me promote my contest, since he could reach a lot of people. Just minutes after I contacted William about the idea, he tweeted this. The whole idea expanded, and it was great to see submissions for it; here, Al describes his entry and thoughts that he would never win. On August 1st, the selected 7 were announced and the next day over a live and very shaky live video, I picked a random winner. Al made it to Las Vegas where we met and hanged out. In there we learned about the circle of karma and this picture is one I tell my family about. This pictures represent a circle that expands a decade. When you do good, good things will happen. Al and I never got a chance to take the picture with William at that VMworld, as a matter of fact, I’ve never met William in person, but Al has and that is super cool. Just last week, I flew to Boston for their 2018 UserCon as I wanted to be there once more, now as a foreigner but always with great love and appreciation for the group that Randy introduced to me 6+ years ago; that assembly of people led by Steve where I gained lots of knowledge, encountered great folks and built awesome relationships, that free resource that permitted so many good things to happen. 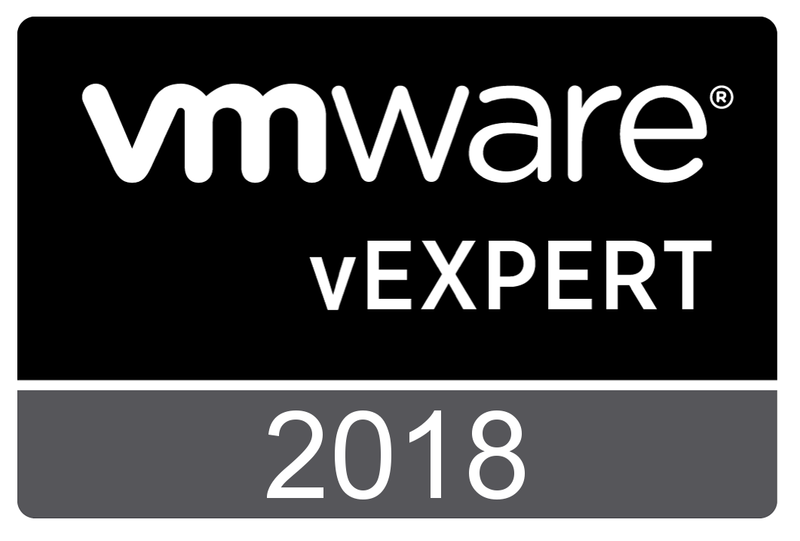 That is my story so far in this great vCommunity, or at least the highlights; I learned tons, improved interpersonal skills, accelerated attaining higher level of certification that probably wasn’t going to be on my radar that soon, without a doubt opening new doors for me. 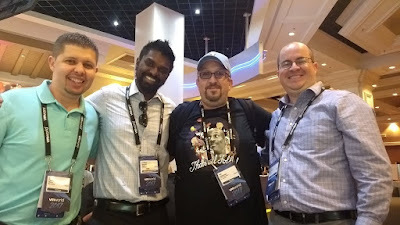 I had an amazing opportunity to in part Pay-it-back with the VMworld pass and make a change for someone who is now a friend (Al Rasheed) and he’s been giving back so much to all of us. There is also the new job with relocation included – there is a lot that originated from being there and so many people to acknowledge and express gratitude. The benefits and opportunities are there and can come to you the way you least expect it; if you are reading this and doubtful of getting involved, don’t think it twice, we’re waiting for you. Thanks to everyone in this awesome community, I will always feel proud to be a member and look for opportunities to pay-it-back and contribute.